We have advisors who speak to hundreds of land managers every year, supporting them in managing their land sympathetically. 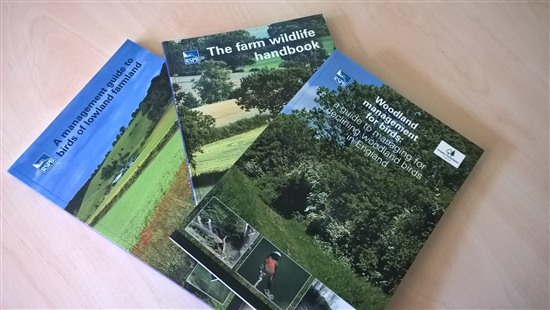 But did you know that there is also a wide range of land management handbooks available from the RSPB? These comprehensive guides have proved incredibly popular over the years, benefitting a wide range of species. If you're already managing for wildlife alongside your agricultural interests or you're keen to start, these handbooks make a valuable reference point, covering the principles and techniques that will help you get the most from your conservation efforts. While stocks last, we are offering these comprehensive guides at the very special price of £5.00 each (plus p&p)!! - I contacted the RSPB about my son's college course. He’s studying agriculture and had to produce a land management assignment. We purchased a handbook and my son was very happy with so much useful information. We are thankful to the RSPB for their swift and very helpful response. It was all very supportive. Christine (South West). - I have some of these books and expect them to provide a wealth of useful information and help my understanding of many issues. With the many changes that agriculture is facing, they are a great resource to understand how to use our land better. They really are value for money and I advocate that anyone interested in conservation should consider any that are relevant and buy one or two accordingly. Martin (Midlands). - As an agricultural advisor, I have found having a few of these books worthwhile. You never stop learning and if you have an interest in land management, so much the better. Yvonne (Scotland). We hope they will encourage conservation management anew and guide existing work.